Factor IX (FIX) is a vitamin K-dependent zymogen that plays an essential role in the coagulation cascade leading to thrombus formation. 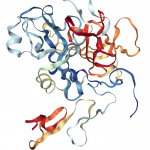 In the presence of calcium, activated Factor IX (FIXa) complexes with Factor VIIIa on phospholipid surfaces to create the tenase complex, which converts Factor X to its activated form. 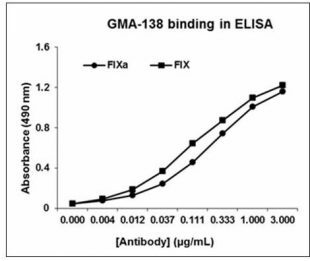 Defect or deficiencies in FIX lead to the X-linked recessive bleeding disorder hemophilia B. GMA-138 binds to FIX and FIXa in ELISA assays, and bound GMA-138 detects human FIX by bio-layer interferometry.